Nova Scotia paramedics are feeling stretched to their limit, and their union says it's putting people at risk. “There were 39 out of town ambulances – and by out of town I mean outside communities – in HRM, meaning that at least 39 towns possibly had no ambulance,” says Terry Chapman International Union of Operating Engineers, the union representing paramedics. Chapman says an ambulance had to be pulled from Antigonish to cover Cape Breton Monday night. 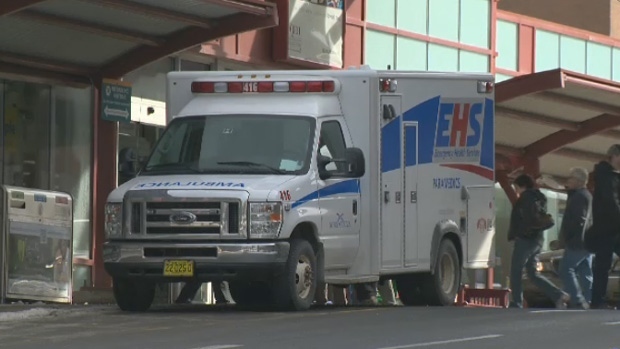 “It was reported to us that there were no available usable ambulances in Cape Breton,” he says. But EHS argues that's exactly how the system is designed. “We respond to actual or anticipated demand. So we have an actual call, we'll assign a resource, and then we shuffle our system around behind it,” says Jeff Fraser, director of provincial operations for EHS. Fraser says the entire health care system is under duress and busier than ever before. EHS averages 550 calls per day, but recently dealt with 720 in one day. Fraser says there are no gaps in coverage, but admits response time is affected. “There is no doubt that when we have those busier days, the entire system feels the effects of that,” he says. Former paramedic and NDP health minister Dave Wilson says he wants the government to come up with some solutions to ease the pressure on emergency rooms and put ambulances back on the car. “Do we need to see an increase in the number of inpatient beds we have in our hospital system?” Wilson asks. The paramedics union is calling for a roundtable meeting with Health Minister Randy Delorey, who declined an interview with CTV News on Tuesday. Paramedics say they’re becoming stuck in backed up emergency rooms instead of the road.